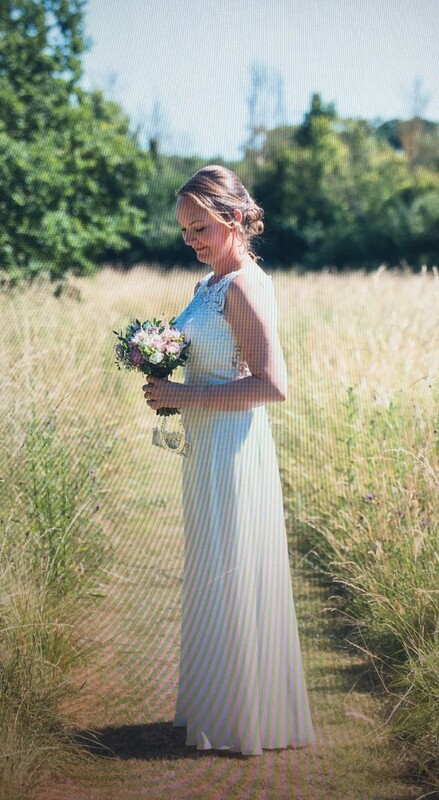 Here is my beautiful wedding dress which I wore on the 29th June 2018. It is from the Rosa Couture range in Village Brides in Wokingham and is called Rae. It was purchased in March this year and is very on trend. It is a size 12 and had no alterations with the exception of some bust pads fitted by a dress maker. I am a standard size 12 and 5ft 9 and it fitted perfectly. I wore 3 inch heels and the dress skimmed the floor without being too long. There dress has been professionally dry cleaned since and is ready to go. The dress is very lightweight which is what I wanted as the day was hot, it is free flowing and allows you to move without being restricted. It almost has a Grecian look to it. The skirt is made up of 3 layers which gives it a floaty look. The lace bodice is fitted a see through back and buttoned up. You can’t wear a bra hence the bust pads to hold everything in place. I wore this ivory dress with simple ivory brocade shoes from Coast with a matching clutch bag. It’s a beautiful, simple and elegant dress. I love it and am only selling it because I know I’ll never have the need to wear it again! If you are local you are welcome to view. Would prefer collection only but If it is sent it will be posted in a professional dress box to keep it safe.